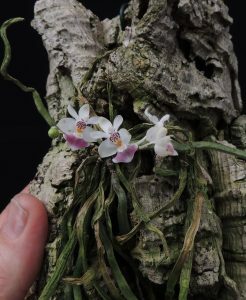 This tiny Phalaenopsis species is one of our favourites. The delicate flowers are scented and produced on short spikes. The species is native to lowland forest in the Eastern Himalayas through to South East Asia. The plant produces masses of flat green roots which are likely to be significant in photosynthesis as the leaves are small and can be semi deciduous. There is a group of Himalayan phalaenopsis that are largely leafless in response to coping with the dry season and this species is kind half way towards leafless. As a result it enjoys being mounted and we grow the plant in Warm Asia in shade throughout the year.